A "super-hospital" PFI project, which ran up £15m costs before being abandoned, has been criticised by the National Audit Office (NAO). The Paddington Health Campus plans to merge three hospitals on a west London site fell through, after projected costs shot up from £300m to £894m. The NAO report said the scheme should have been abandoned two years earlier, or new plans drawn up. The government said lessons had been learnt. Critics called it a "shambles". The health complex in Paddington, which would have merged St Mary's, the Royal Brompton and Harefield hospitals was approved in October 2001. Health bosses thought it would be finished by 2006. Instead, projected costs more than doubled and the completion date slipped to 2013. 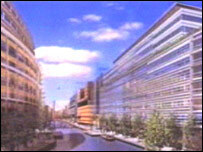 The North West London Strategic Health Authority (NWLHA) withdrew the plans in June 2005. Half of the £15m had gone on the trust's own "organisational expenditure", half on consultants, NAO director Karen Taylor told BBC London. The NAO report found the scheme failed because partners could not buy enough land or agree on whether the scheme was affordable. Planners also predicted there would be less need for beds in the area in future. NAO head Sir John Bourn said: "The original business case was inadequate, the lack of a single sponsor was a fatal flaw and the final scheme was not deliverable." He said the Department of Health (DoH) should note his conclusions in order to better provide value for money to taxpayers, patients and staff. Tory MP Richard Bacon, of the Commons Public Accounts Committee, said: "This is an object lesson in how not to build hospitals. "This scheme has been a shambles of the first order. The real tragedy is that £15m later, healthcare facilities for the people of London have not improved one bit." Liberal Democrat health spokesman Steve Webb said it was "incompetence on a massive scale". The NWLHA's own report found the project failed because of poor management and weak foundations - but said problems had also been caused by DoH policy changes. The DoH said it now approves expensive schemes at an outline stage, which it said should prevent a repeat of the problems. A spokesman said other steps introduced included more checks on project management and tighter criteria for outline business cases. He added: "Today's report confirms that no single factor was to blame for the project's cancellation and highlights that it was totally unconnected to the Private Finance Initiative." Across London, work has begun on the UK's biggest hospital PFI project - redeveloping Bart's and the Royal London.